Researchers at Rensselaer Polytechnic Institute and Rice University have created the darkest material ever made by man. Lin’s team created a coating of low-density, vertically aligned carbon nanotube arrays that are engineered to have an extremely low index of refraction and the appropriate surface randomness, further reducing its reflectivity. 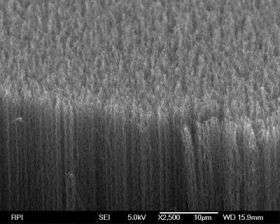 The end result was a material with a total reflective index of 0.045 percent – more than three times darker than the previous record, which used a film deposition of nickel-phosphorous alloy. So...this thing would heat up really fast in light right? Query for any physicists out there who understand this from a science perspective - What happens to all the light it absorbs? Would it theoretically turn into a black hole if it absorbed enough light for a long enough time? First off it would not heat up really fast. Because it is made of billions of very small tubes it's surface area would be near infinite compared to it's volume. Which would mean it stay cool. And as for a black hole, they have nothing to do with light. A black hole forms when the gravity forces in a star over come the explosive forces of fusion. Depending on the size of the star it could collapse enough to become a black hole with the gravity of the star that it was before. Then it'll begin to pull and move toward objects. Light in its photon form has technically no mass because of it's speed but needs mass to be attracted into the black hole. And yes that seems messed up but that's about how it works.